Wellness policies and guidelines have recently been put in place to help promote healthy eating for students throughout the nation. These policies still allow Chocolate fundraising. The Healthy Hunger-Free Kids Act of 2010 has changed school snack standards in vending machine selections, student stores and lunch lines. 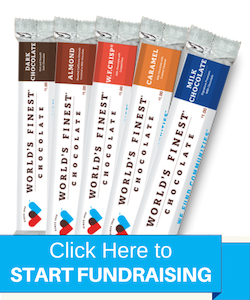 These new standards are now in effect, and still allow for fundraising with World’s Finest Chocolate. 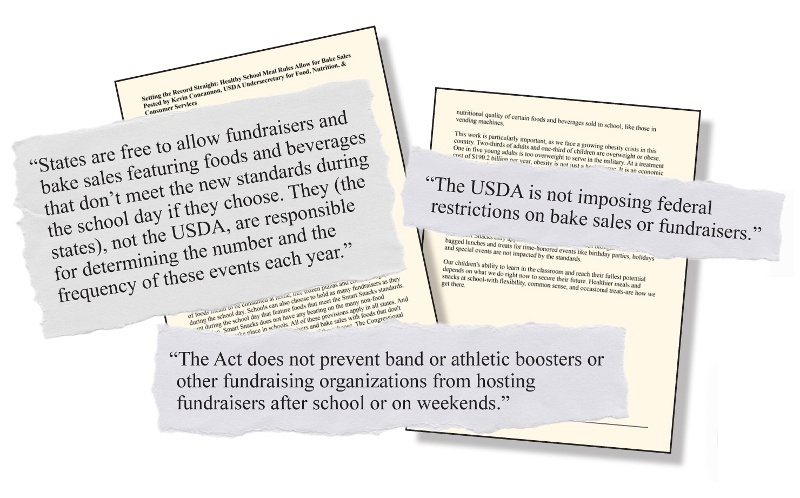 According to the USDA, the rules do not affect off-campus fundraisers or events held after school hours on campus. CAN WE STILL FUNDRAISE WITH CHOCOLATE BARS? Yes. Per the USDA, you can fundraise with chocolate bars as long as they are sold off campus, after school hours. Students can sell to family, neighbors, and community supporters, just as they have always done. CAN WE STILL HAVE CHOCOLATE FUNDRAISING PRODUCTS DELIVERED TO OUR SCHOOL CAMPUS FOR STUDENTS TO TAKE HOME TO SELL? Yes. Remind students that they cannot open the fundraising chocolate cases until they have brought them home. CAN STUDENTS STILL TURN IN MONEY COLLECTED FROM THE CHOCOLATE FUNDRAISER DURING THE SCHOOL DAY? Yes. The chocolate fundraiser profits can be turned in during the school day. You just can’t make any of the sales during the school day or on campus. 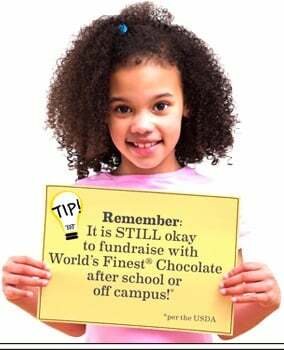 CAN WE PROMOTE A CHOCOLATE FUNDRAISER DURING THE SCHOOL DAY THROUGH POSTERS, ANNOUNCEMENTS, OR ASSEMBLIES? Yes. As long as the chocolates are not sold on campus during the school day, promotions are permitted during the school day per the USDA. WILL WE LOSE SCHOOL LUNCH FUNDING IF WE FUNDRAISE WITH CHOCOLATE? No. As long as the fundraiser is sold off campus, after school hours, you will not lose school lunch funding per the USDA. The Healthy Hunger Free Kids Act allows states to make their own exemptions to the policy that allow for foods that do not meet the wellness guidelines to be sold as fundraisers on campus, during regular school hours. States can determine how many fundraisers like this can be allowed, and how often they can be held. There are currently 20 states that have developed exemptions. DOES MY STATE HAVE FUNDRAISING EXEMPTIONS? HOW DO WE GET FUNDRAISING EXEMPTIONS IN OUR STATE IF WE DON’T ALREADY HAVE THEM? Educate parents and teachers on the importance of fundraising exemptions so your club can conduct chocolate fundraisers during the school day. Encourage them to write letters to their state legislators and your state’s school board. Emphasize what the funds raised are used for, and how important fundraising is for your group. CAN WE FUNDRAISE WITH CHOCOLATE EVEN IF OUR STATE DOESN’T HAVE ANY FUNDRAISING EXEMPTIONS? Yes, you can still run chocolate fundraisers off campus, after school hours per the USDA, even if your state does not have any fundraising exemptions. The chocolate fundraising product can be delivered to your school and distributed to students during the school day, as long as the packaging stays sealed until students takes it home. You can also promote the fundraiser through posters, announcements, and assemblies during the school day. The chocolate fundraiser should be sold off school grounds, to family, neighbors, and community supporters. Your school will not lose any federal lunch program funding if these guidelines are followed. MY STATE ALREADY HAS FUNDRAISING EXEMPTIONS. HOW DO I USE THEM? Procedures vary by state. Talk to your local school administration to find out how you can take advantage of your existing fundraising exemptions.